Thanks to Jenna Beaugh for letting us excerpt portions of her wonderful blog and use her photographs for this story. Thanks to Adam’s keen planning skills, Jenna was lucky enough to have her candid proposal caught on film by a professional photographer. While on a camping trip in the beautiful Hendy Woods of Mendocino County, Adam dropped to one knee and presented Jenna with the ring of her dreams. With a proposal story that included a fake face-plant in the mud, a treasure hunt of love notes, and a posse of good friends eager to participate in the romantic ruse, Jenna and Adam were engaged. 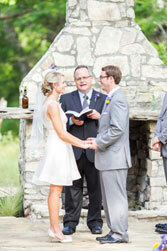 On to the wedding at Pecan Springs Ranch in Austin, where the bride looked stunning in a long white veil, kitten heels and, of course, the custom-designed ring that Adam chose from Sausalito Jewelers. Read Jenna’s retelling of this utterly charming story on her blog.